Although many people help to organise or increase the safety of the bull run, there are but two protagonists in this event: the runners and the bulls. Without these two participants, the bull run would just not happen, without the rest of the helpers, the bull run would take place, although it would not be so safe. It is calculated that some 2,500 runners participate in the San Fermin bull run on weekdays, a figure which rises to 4,000 at weekends. However, not all these people can be considered to be runners, given the fact that more than 1,000 people enter the ring hundreds of meters ahead of the bulls, and at least one minute beforehand. With regard to the rest, some 500 run close to the herd but when the bulls are just five meters behind, they can't stand the pressure and withdraw to the sides to watch the bulls go past. The remaining 500, more or less, run at the front, with the bulls right behind them, taking over one runner from another in 40 to 50 metre sections and running right in front of the bulls for just 8 to 12 seconds. 70% of the runners in the street are aged between 20 to 35 years old, approximately 10% are under 20 and the remaining 20% are over 35, with some experienced runners aged over 50 and even over 60. The runners' origins are as follows: 40% from Pamplona or Navarre; 30% from Spain and a further 30% are foreigners. 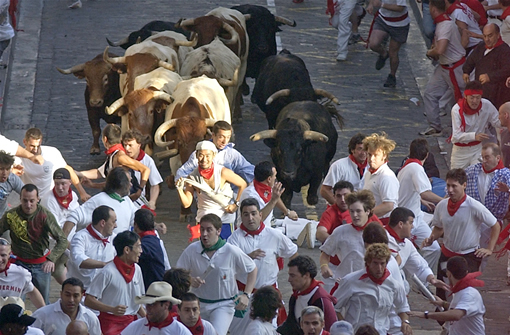 The actual run lasts approximately two and a half minutes and no-one, even competent sportsmen, can complete the 850 metres long race with the bulls due to the confusion reigning the street, where you need to put up with pushes whilst sprinting, dodge slower runners, jump over people who have fallen over and, of course, keep a constant eye on the bulls running behind. With regard to running techniques, there are basically two: the first is to run and gradually increase speed until the herd reaches you and then find a gap right by their horns. The second - which only serves in the final 200 metres of the race when the bulls slow down - is to wait at the sides and, when the herd can be seen to be some 10 metres behind, to jump into the centre of the street and sprint along. However this second option is extremely violent and dangerous for runners starting to run and for those who are already running who are inevitably knocked over.